I'm an ice cream junkie, but more than ice cream, I love frozen yogurt. Until now, there have only been a few retailers that offered this cool treat. 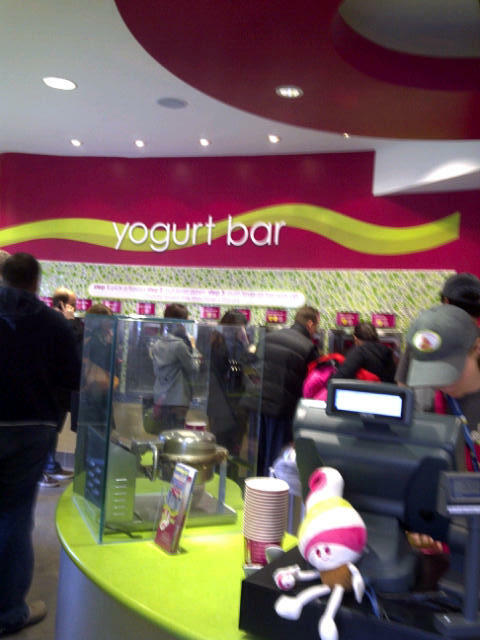 Lucky for me - and Torontoians - the popular shoppe Menchies has moved in. They've opened two locations so far - one on Bloor Street (near Bathurst) in Toronto, and one in Thornhill. Double lucky for me: this weekend I was kindly invited to participate in Blogurt Fest 2010! If you've never been to Menchies, the concept is simple. 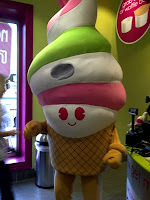 You choose your fro-yo, and you build your dessert - yes, you actually get to work the machine and try and make the frozen yogurt swirl properly! 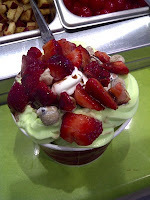 After you mix and match your flavours (I loved Cake Batter and Green Apple Tart), you move onto toppings. The selection is incredible - everything from walnuts, to chocolate chips, to mini-rolos and oreo pieces. It doesn't end there, though. Add fresh ingredients like strawberries, chocolate chip cookie dough (my fave), cherries and top it all off with a handful of sauces, some of which are available in sugar-free options. If I had to be a critic (which I often am), it would be fabulous to incorporate some interesting toppings to the Menchies menu. I'd love to try a Chocolate Frozen Yogurt with Hot Chili Pepper, for example. Nonetheless, the selection is vast and I'm sure the offerings would satisfy any customer. 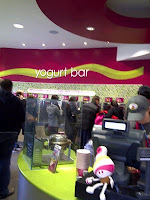 For Blogurt Fest, about 20 bloggers from across the GTA gathered to design their own frozen yogurt masterpiece. Esteemed judges Adell Shneer, (Senior Food Specialist, Canadian Living Magazine) Annabelle Waugh, (Food Director, Canadian Living Magazine) and Joanne Yolles (Pasty Chef, Scaramouche) had the toughest job of tasting all the entries and grading the yogurt creations!! This interesting event was put on by the lovely-and-talented foodie and PR wonder, Mary Luz Mejia from Sizzling Communications. I named my treat La Dolce Verde. I used a combination of Cake Batter and Green Apple Tart frozen yogurt, topped it with Chocolate Chip Cookie Dough, Strawberries and Chocolate Sauce. I've learned from many chefs over the years, and while it did taste great, the presentation was great! Hey, your food needs to look good, right??? The competition was fierce! In the end, I didn't win, but did have a great time participating in the first ever Blogurt Fest. If you're near a Menchies, try it out for yourself and create your own icy masterpiece! !